A local journalist is on the verge of facing trial. State Prosecutor has begun legal action against him after the reporter accused Kuwait’s Emir Sheikh Sabah Al-Ahmad Al-Jaber Al-Sabah of succumbing to U.S. President Donald Trump’s pressure to cancel oil contracts worth $11bn with China and signed similar deal with America. Daily Star said Tuesday Public Prosecutor Mirna Kallas Monday concluded the questioning of journalist Salem Zahran. The questioning came after State Prosecutor, Judge Samir Hammoud referred Zahran’s case to Kallas. Zahran has caused storm in the relation between Lebanon and Kuwait, in an interview with Lebanon-based Al-Manar TV. The journalist, believed close to Iran-backed Hezbollah, accused Sheikh Sabah of giving in to President Trump, as he allegedly cancelled oil contracts with China, in favor of the U.S. The Kuwaiti ruler met with President Trump early this month in Washington and talks between the two sides reportedly revolved around bilateral relations and regional issues including Yemen, Palestine and continuing boycott of Qatar by Bahrain, Egypt, Saudi Arabia and the UAE. 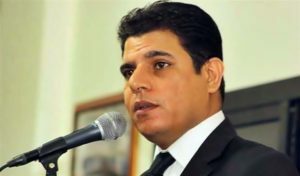 Zahran’s comments drew anger from Kuwait City. Kuwait Information Ministry lambasted the journalist’s stance and described the comments as “defamation, slander, falsification of facts and an attempt to mislead the public”. Lebanon’s Prime Minister-designate Saad Hariri was quick to try to extinguish a likely tension. He met with Kuwaiti ambassador to Lebanon and re-affirmed Lebanon’s admiration and respect for Kuwait, and rejected the allegations made by Al Manar TV against Sheikh Sabah. “What occurred during the television program is an act outside the Lebanese national consensus regarding relations with Kuwait and the rest of the Arab brothers,” Hariri said. The same tone was used by Nabih Berri, Speaker of the Parliament. “The Lebanese will always remain indebted to Kuwait, its emir and people, for all their support to Lebanon in the days of hardship and prosperity, and will allow nothing to disturb the historical relationship and brotherhood ties between the two countries,” he is quoted as saying. Written by: KanelkaTagba on September 18, 2018. Posted by KanelkaTagba on Sep 18 2018. Filed under Headlines, World News. You can follow any responses to this entry through the RSS 2.0. Both comments and pings are currently closed.